Welcome to Napier Baywatch Homestay. We have a very comfortable and sunny self contained garden unit with Queen size bed and ensuite. Sky tv, internet access with own computer, tea and coffee facilities and small kitchenette with fridge and microwave. The unit is in our garden but it is separate from our home to ensure your privacy. However, we are available for any local information or recommendations. Off street parking. We are only a 10 minute walk to Ahuriri with all its restaurants and bars, and about 15 minutes into Napier City for some great shopping and Art Deco attractions. If you don't fancy walking back up the hill a taxi is about $10. It is a 5 min walk to the Botanical gardens and historical cemetery. We are also just a short drive (20mins) from the many wineries in the region. Further afield (40 mins) are the beautiful beaches of Waimarama and Ocean Beach. Or why not hire some bikes and explore some of the 180kms of cycle ways. Sky TV. Private and quiet location. Relaxing. Free WiFi internet. 2 seater couch and Sky TV to watch all the sport, news and movies. We had a wonderful three night stay in the lovely sunny studio. The studio had everything that we needed and was very clean and comfortable. 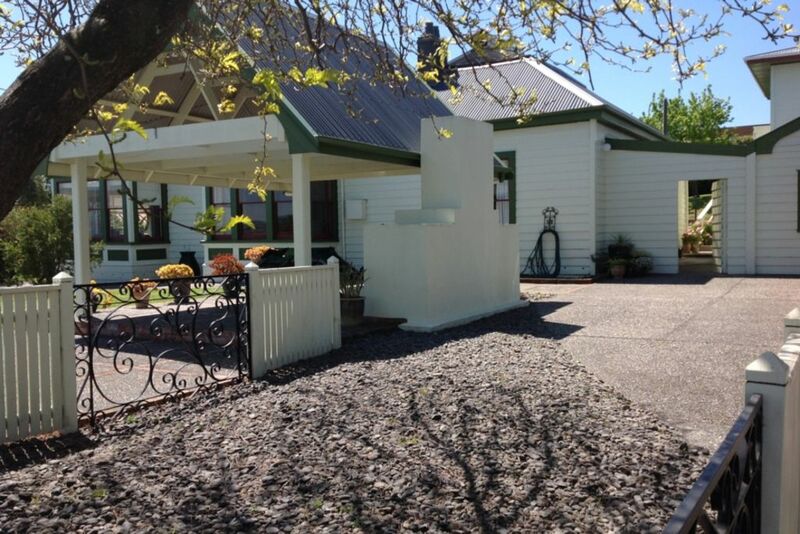 The location is great and within easy walking distance to the city centre and Ahuriri. Ann and Trevor were excellent hosts. We would defiantly stay there again. It was an absolute joy to have Heather and David stay with us last weekend. They were in Hawke's Bay celebrating a friends 60th birthday and made the most of their time here visiting friends, checking out the local urban food market on Saturday morning and generally relaxing before the big party on Saturday night! Really nice people who were engaging and easy to talk with. They were excellent communicators on ETA and left the studio unit in spotless condition. We would welcome them back to stay anytime and highly recommend them to other hosts. Peter and Nonnie were excellent guests and we enjoyed having them stay. They let us know what time they were due to arrive so that we could meet them and let them know a little bit about of the cafes and restauarnats around Ahuriri (10 mins walk just down the hill) as well as recommending sights to see and things to do that suited their tastes. They certainly seemed busy and were out and about most of the day they were here. They were considerate and left the place spotless. It was really nice to meet them and I believe they enjoyed staying at our self contained studio. I would highly recommend them as guests and would welcome them back if they are ever back this way. Trevor and Ann are fabulous hosts can’t fault it! Dave and Jenny were fabulous guests. They left the place in really tidy and clean condition, good comunication on arrival times and were just nice people to have stay. We hope they will come back and stay with us and experience more of what Hawke's Bay has to offer. This was an awesome place to stay. Just a short walk to Ahuriri where there were many options to dine. No need to drive. Easy access to walkways and not that far to walk into town along the port. Our hosts Trevor and Ann were great with loads of helpful info on the region and sights that should be seen. Our accommodation was lovely with views of the ocean. We would definitely stay there again. Paul and Barbara were excellent guests. Very independant and left the place spotless. Lovely to have them stay and I would certainly recommend them to future hosts. We look forward to welcoming them back in the not too distant future. Lovely hosts, very friendly and welcoming. Would definitely stay again. Thanks very much. Great guests who left the place in good condition. Would recommend them and very welcome back anytime. Ann and Trevor were an incredibly warm and friendly couple, a pleasure to stay with the BnB was amazing had everything we needed providing an excellent experience and wonderful time enjoyed by myself daughter . Located on top of Napier Hill with panoramic views over Hawke's Bay to the North West and West, Baywatch offers and ideal location to relax and unwind or to explore all that the region has to offer. We are within walking distance to the pubs and restauarnts of West Quay (overlooking the quaint marina) and also the poplar Ahuriri Village area. Plenty of options for breakfasts, brunches, lunches and dinners while basking in the sun or sunset. A 15min downhill stroll into Napier township (Art Deco capital of the world!) and if you don't fancy walking back uphill a taxi will cost you $10. Every popular HB wine tours can be arranged (Trevor is a guide) or suggestions of where to go and what to see if you prefer to arrange your own tour. Safe off street parking available.